Last evening, we had a large rain storm with thunder and lightning but the morning was much cooler and the sky was clear. 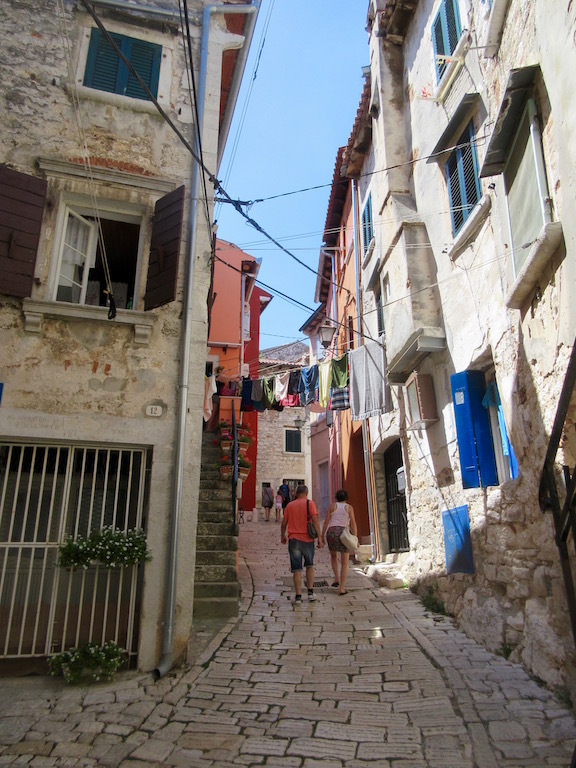 Dario, the owner of our hotel, spoke to us on this morning about how he came to Rovinj about 18 years ago and began to buy and renovate old buildings that were mostly inhabited by refugees from the 1991war. Many of the buildings at that time had been left vacant for decades and in many cases abandoned since the 1940’s by Italian families. 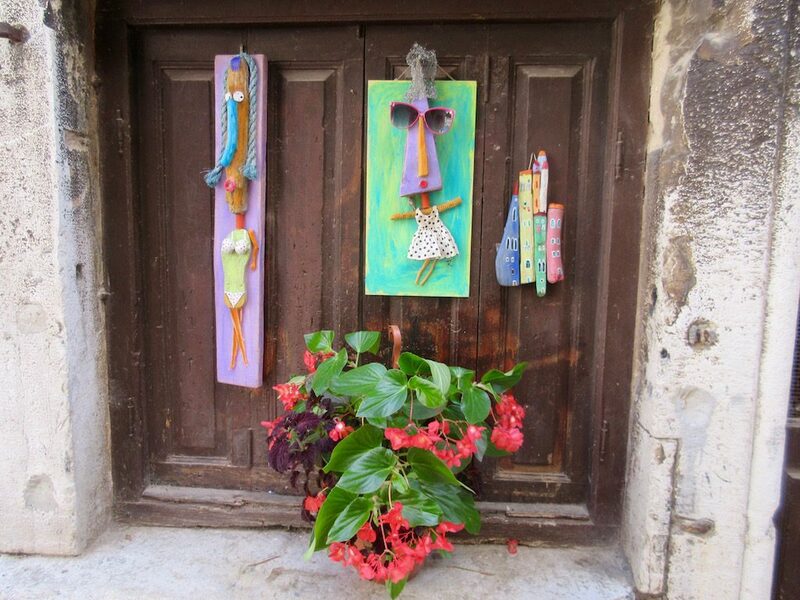 Dario now owns and operates several buildings and rents rooms out to visitors like a hotel. Every room is different and has its own unique style depending on how large the rooms were in the past. They have all been beautifully restored and furnished with modern baths, hardwood floors, air conditioning and modern electricity. 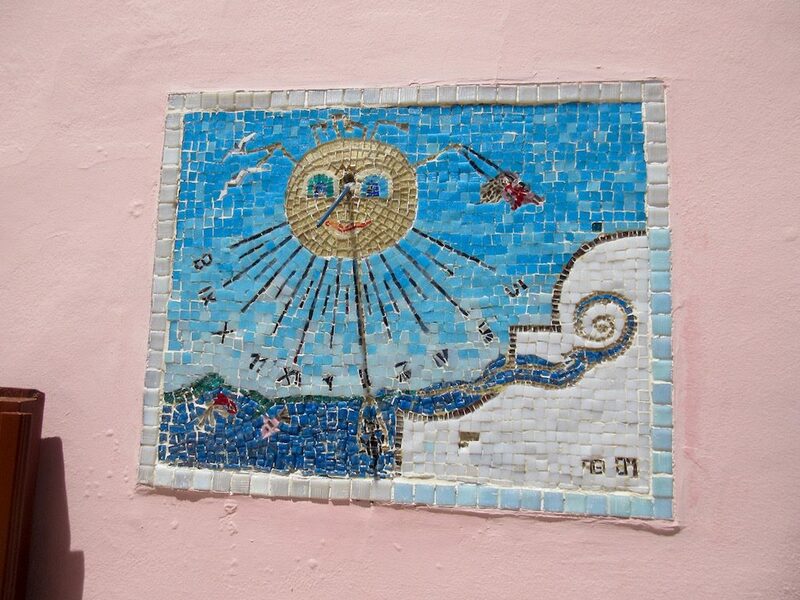 Our lecture this morning by Erla was about the symbol of Venice being found all over the Istrian peninsula. 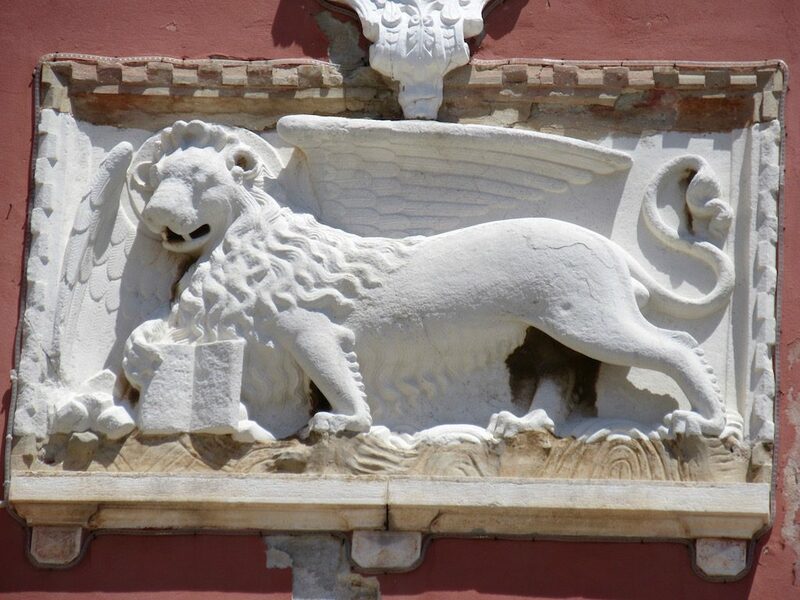 The lion with wings is the symbol of St Mark which is the patron saint of Venice. Most often shown with the front paws on land and the rear legs on the sea. It is also depicted with an open book in its paw. The afternoon was free to explore town on your own. Some folks took walks while other chose to swim in the sea. 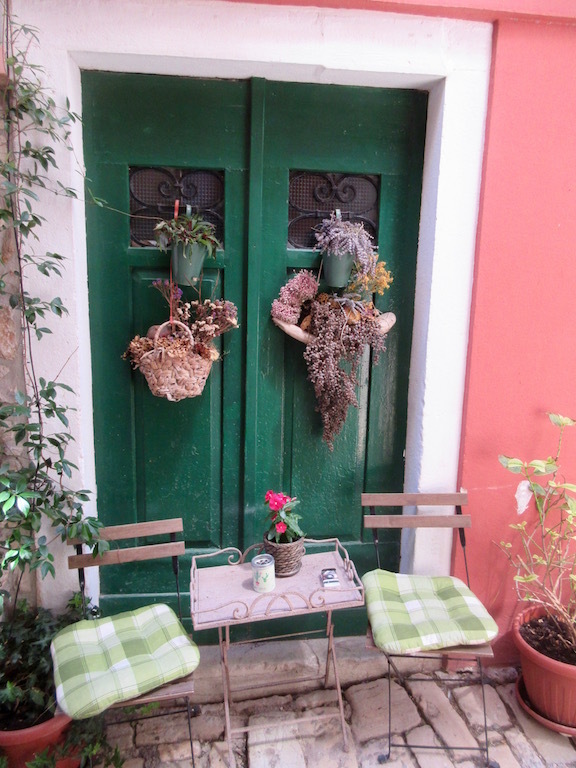 Kent and I had a late lunch at a small restaurant called Neptune in a back alleyway out of the afternoon sun. Kent had a large plate of a “Weiner chicken” something like a Weiner schnitzel. Pounded chicken battered and deep fried and served with French fries. Mark had a plate of cheese ravioli in a white cream sauce and a side green salad. 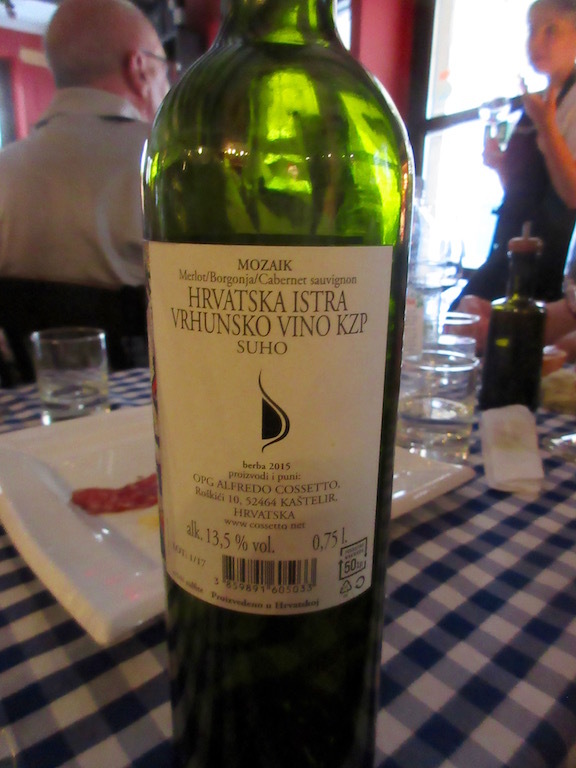 At 6:00pm we met up for another wine tasting class where we tasted three local red wines. The wines we tasted are made from local grapes and are not aged at all. The varieties of wines were called Teran and Mozaik as in Mosaic. They are only from the 2015 and 2016 harvests and are considered fresh wines. Along with the wines they served up a platter of cheese with truffles, polenta, a sliced sausage that was excellent and another spreadable cheese with truffles on small bread crisps. All very good. After the wine class we spent some time along the waterfront watching the world go by before retiring to bed early. Kent is still recovering from his chest cold and was not feeling up to walking much.